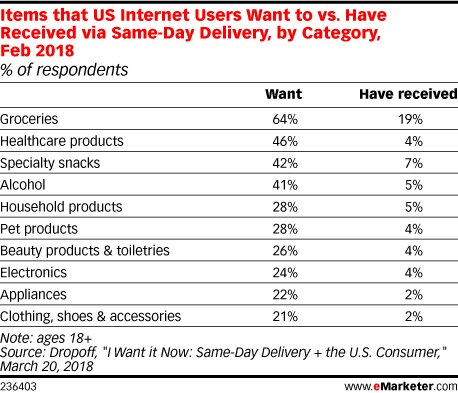 Data is from the March 2018 Dropoff report titled "I Want it Now: Same-Day Delivery + the U.S. Consumer." 995 US internet users were surveyed online in February 2018. All of the respondents answered "yes" to the initial question, "Do you ever purchase items that need to be delivered?" The respondents were female (52.0%), male (47.2%) and prefer not to say (0.8%). The respondents identified their ages as 18-36 (56.1%), 37-53 (29.7%), 54-72 (14.1%) and 73-100 (0.2%). Respondents identified their household income range as less than $25,000 (15.9%), $25,000 to $49,999 (29.6%), $50,000 to $74,999 (26.5%), $75,000 to $99,999 (14.5%), $100,000 and up (12.4%) and prefer not to say (1.2%). 38.9% of respondents were luxury shoppers and 61.1% were nonluxury shoppers. 22.7% of respondents were early tech adopters and 77.3% were not tech adopters. Dropoff is a delivery service provider.